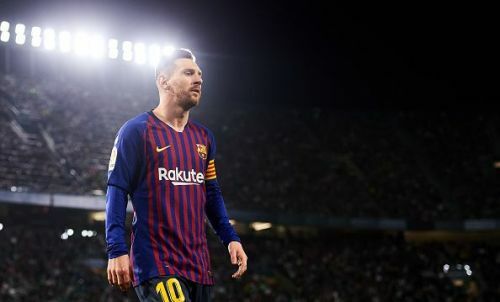 Real Betis coach Quique Setien has heaped praise on Barcelona captain Lionel Messi for the outstanding performance that even earned the Argentine a standing ovation from fans of the opposition on Sunday night. Messi was the man behind three of the four goals Barcelona scored to win 4-1 against Real Betis at the Benito Villamarin Stadium on Sunday. The 31-year-old opened the scoring with a superb free-kick early in the first half before firing two more to complete his 33rd La Liga hat-trick. The win further cements Barcelona's place at the top of the league table with closest rivals Atletico Madrid now sitting ten points away in second place. Speaking of Messi's goal-scoring exploits, Barca coach Ernesto Valverde said (via Marca), "Our opponents suffer because of Messi, but they also enjoy him. His match tonight was extraordinary, he's scored three goals and also made a fourth." It appears Valverde wasn't the only admirer of Messi as Real Betis coach Setien has also heaped praise on the Argentine, even adding that he does not think Brazilian icon Pele had the "continuity" that the Barcelona captain has. According to Mundo Deportivo, he said, "I really liked the response of our fans, appreciating a great player that today we have suffered in our flesh, but that usually makes us enjoy football. The behaviour has been extraordinary." "I have not seen any player like Messi in history. He has been doing it for 10 years. I do not know if Pelé had the continuity of Messi. It's a luxury." Barcelona is next scheduled to face Espanyol in La Liga after the international break.